Address: Budapest, Pest side, 6th distr. in Eötvös street on the 3rd floor of a nice old building, close to Oktogon square what is the cross of the world famous world heritage Andrássy ave. and the grand boulevard named: Nagykörút. Rooms: 3 rooms + kitchen, bathroom. Amenities: The apartment is for max. 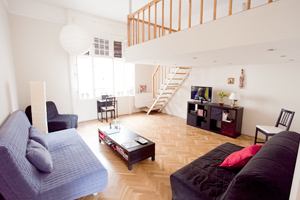 5 persons, it has one big living room with a 10 m2 gallery. In the living room there are one sofa double-bed, one sofa single-bed and on the gallery there is one double bed. There is a nicely equipped kitchen (owen, fridge, micro, toaster, dishes etc.). The bathroom is comfortable furnished with washing machine, shower cabin, hair dryer, tower dryer. In the apartment you can find TV with DVD player, dining furniture. This quiet apartment is on the third floor in a typical Budapest downtown house, which is also cool in summertime and has a lift. Bed sheets, towels free maps would be provided for you. Location: The apartment is in Eötvös street close to Oktogon square what is the cross of the world famous world heritage Andrássy ave. and the grand boulevard named: Nagykörút. Here you find the best public transport like tram 4 or 6 or the yellow underground (which is the 2nd oldest metro in Europe). This immediate area is called the "Budapest Broadway" and "Coffee City" also because we used to have 21 theatres in the surrounding streets and hundreds of Coffee Houses with open air terraces. Easy walk to all the important sight in downtown as Opera, Parliament, St. István Basilica, the great Synagogue, City Park and Széchenyi bath, Heroes Square with Fine Art Museum and Arts Hall or Margit Island what is a beautiful green park area. -Public transportation: Ferihegy International Airport: Reptér (Airport) bus to Köbánya-Kispest -> Metro3 (blue line) to Deák tér -> Metro1 (yellow line) to Oktogon -> cross by walk for 100 m. the Oktogon square.